As one of the last shows before Madison, Expo Quebec marks a great opportunity to figure out who are the contenders and who are the pretenders. 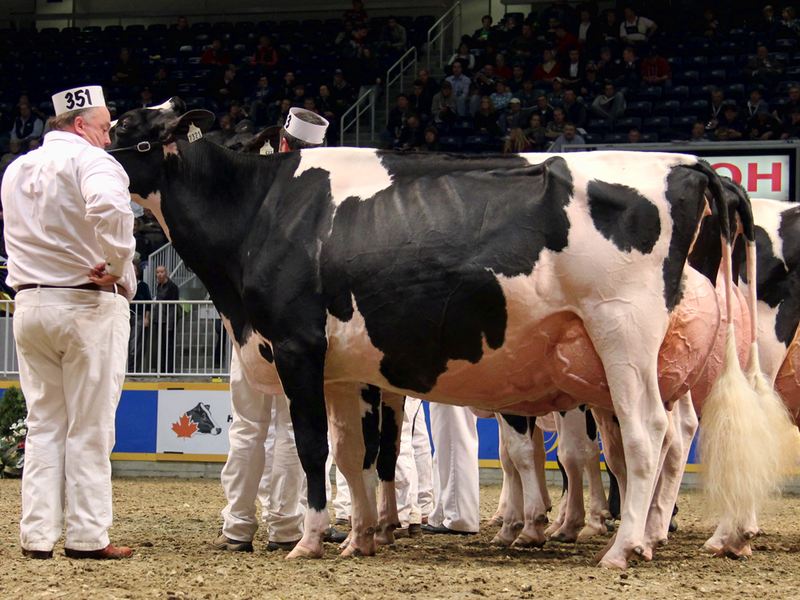 Arguably, Quebec breeders have one of the strongest passions for exhibiting top Holstein cattle, and this year’s edition of Expo Quebec did not disappoint. That why it is so amazing to see two full sisters dominate such a competitive show. 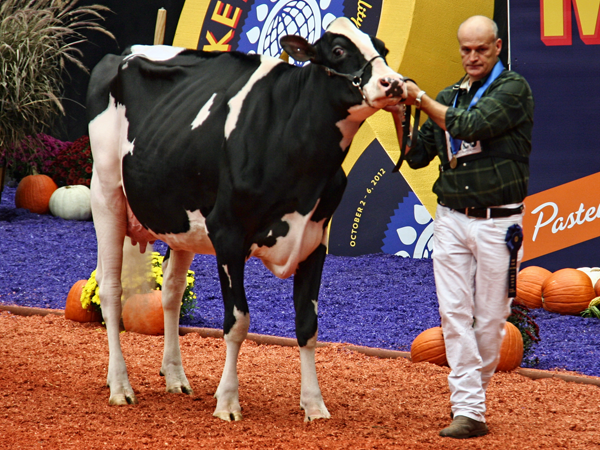 It has been a long time since two full sisters dominated a major show, but that is exactly what happened this past weekend when RF Goldwyn Hailey and RF Goldwyn Halona took home the Grand Champion, HM Grand Champion and the Intermediate Champion honors. To figure out how this happened we decided to find the story behind the story. After spending the 2011 show season in the shadow of Eastside Lewisdale Gold Missy, it now appears that Hailey is ready to shine, while Missy is off making eggs. Since earning Res. All Canadian and America honors last year, Hailey is ready for 2012. It makes you almost wish Missy was back. What a battle that would be. While Hailey is well known to most show enthusiasts, Halona is just emerging on the scene. Despite a strong showing at Madison last year where she finished 10th, Halona, has only one show victory to her credit at Ayer’s Cliff last year. However, never underestimate the power of great genetics and a great “hotel”. 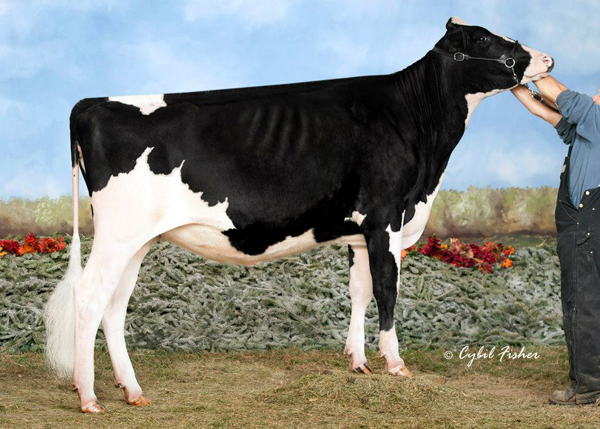 And there is no better hotel than Lookout Holsteins for Halona to mature in. Callum and the team give the cattle the best care in the world so that they can live up to their potential. Halona is certainly responding. When it comes to many great show cattle, we have to recognize that they are such an extreme of the breed that often it is hard for any of their other family members to achieve similar success. That’s part of what makes this story so intriguing. Here we have two full sisters achieving success at major shows. So how does happen? 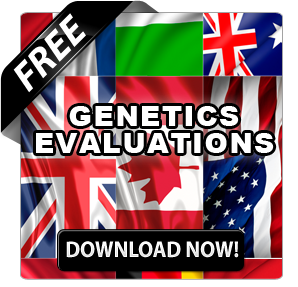 Well in this case it isn`t a fluke it’s great genetics. 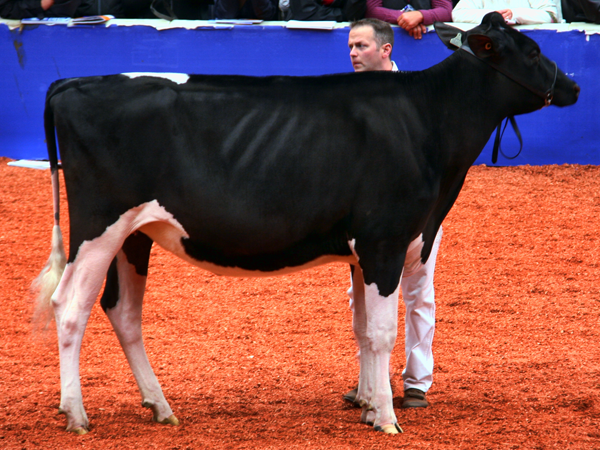 Their dam, MELLHOLM LOUIE HANAH EX-92-2E CAN 2* was a show winner in her own right, winning HM. All Canadian Sr. 2YR honors back in 2005. When you cross the chest width, body depth and pin width of Hanah on the bone quality and set of legs and the proven ability to sire show winners of Goldwyn, the real question is, “How could you miss?” When you add in the fact that along with these two daughters another full sister, RF GOLDWYN HALTON, also went VG-86-2YR, and you realize the odds are stacked in their favor! 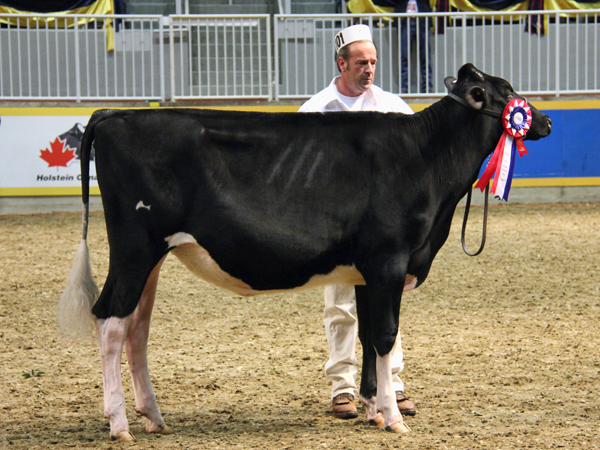 From November 2006 until September 2007 the Judge David Crack Jr. and his family Crackholm Holsteins owned Hailey, and are currently marketing a VG-86 2yr Baxter daughter, CRACKHOLM BAXTER HANNAH. Does that make easier for David to win with Hailey? Yes and no. “Yes!” because the judge has had firsthand knowledge of how great the cow performs. “No!”Because he knows that all eyes are on him and he had better be 100% sure in his decision. 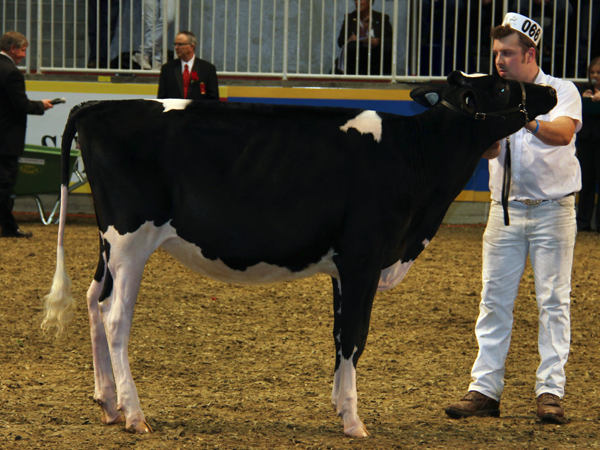 But David is not afraid to make the tough decisions as we have pointed out before on The Bullvine (read Dairy Show Judging – It Takes Courage), when he showed the courage of his convictions by choosing to win with Earlen Goldwyn Secret over the highly touted Craigcrest Rubies Gold Rejoice. This time he is taking the 10th place Sr. 2yr old from Madison last year (where Rejoice was the class winner) and making her his intermediate champion. Does this build or break David’s credibility? “It definitely builds.” He is not afraid to stand behind what he thinks. I have always had great respect for David from the time I first met him at 4-H shows. Gen-Com paid $100,000 to purchase Hailey back in July 2010 at the Excellence of Cowtown International Sale, but if she marches to the head of the line at Madison or The Royal ,she will look cheap compared to some others that where purchased for upwards of a million dollars attempting to get the same thing done. And, who knows, maybe Halona will be right behind her. That would make them the first full sisters to win the honor. 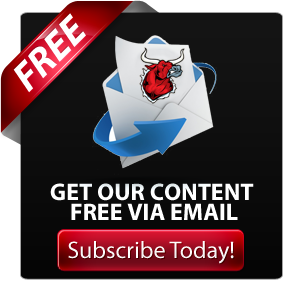 At the Bullvine, we pride ourselves at bringing you more than just the results. We try to bring you the story behind the story. Now you have it. 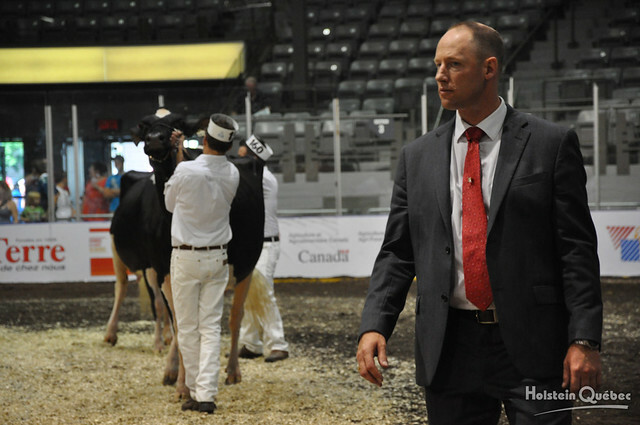 I had the opportunity to attend Ontario Summer Show last week and saw something that really got me thinking. 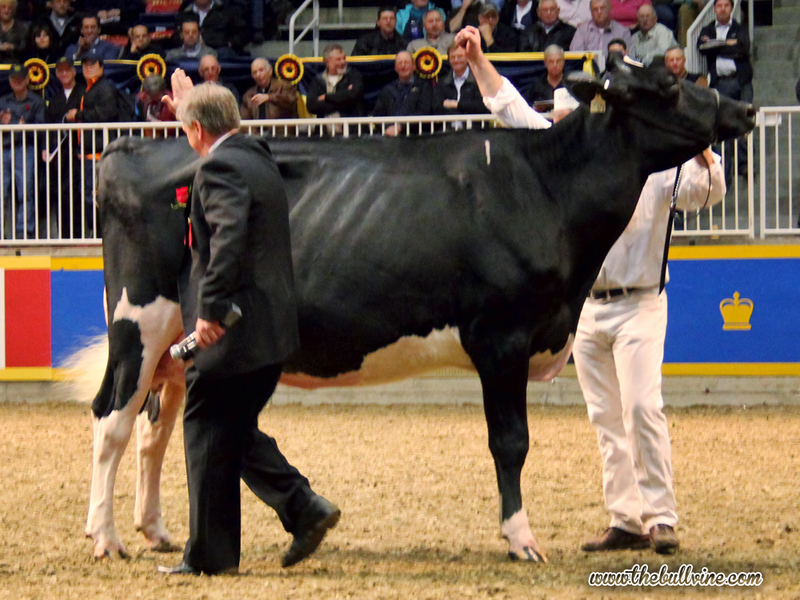 During the Senior 3 year old class, Judge David Crack Jr showed the courage of his convictions by choosing to win with Earlen Goldwyn Secret over the highly touted Craigcrest Rubies Gold Rejoice. By now everyone has heard of Craigcrest Rubies Gold Rejoice. She is the 3 time All-Canadian, 3 time All-American, Res. Int. Champion from Madison last year. But who has heard of Earlen Goldwyn Secret? Her only show winnings of record are 2nd Sr. 2yr at a county show last year. Their records could not be more different. Rejoice has people drooling in the barns over her massive size and her amazing frame. Did this nobody deserve to beat her? Throughout the day, Judge Crack had always gone with the most correct, most dairy heifers and 2yr olds. Therefore, when it came time for the Sr. 3yr old class. To some it may have seemed that he had worked himself into a corner. He could stick with what he had gone with all day and win with Secret or give in to popular pressure and win with Rejoice. As Judge Crack switched the two from his initial pull to then place Secret on top, in discussion with the ringside judges it was noted that making that move would “take a set of balls”. Big ones! Judge Crack either had to win with Secret or he had to put her into third, as the 2nd and 3rd place cows very much typed in together. Consistency is actually a huge part of earning credibility as a judge. While everyone may not always agree with your placings, if they can follow them, and see that you are consistent, they may not agree but they will respect your decision. As a spectator and an avid show advocate this is my biggest beef with some judges. 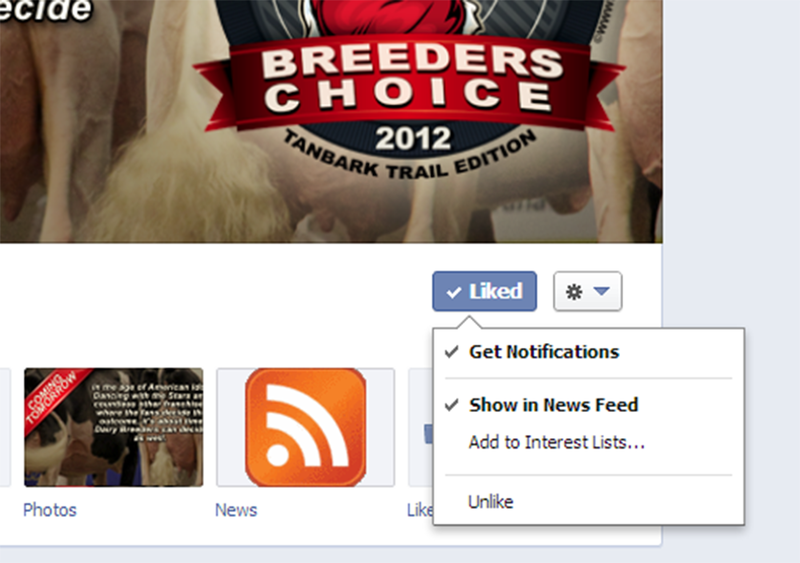 I would like to tell them, “I don’t need to agree with you, but make sure I can follow your placings. Follow a consistent pattern, and you will earn my respect. A question was raised on Friday that I want to address before it goes too far. 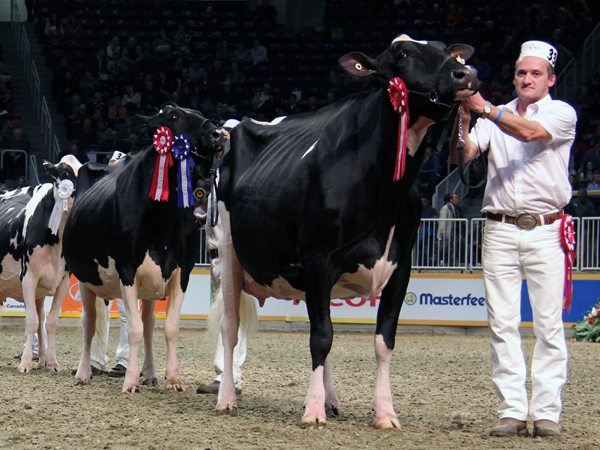 “Is Judge Crack favoring his fellow Quebecers?” Judge Crack’s pattern was definitely there with the winning Senior 2 yr Old, Junior 3 year old, Senior 3 year old and 4 year old who would eventually be pulled to the centre of the ring for the final selection of Champions. Indeed, a heck of a day for Ferme Yvon Sicard, Ferme Blondin and Ghyslain Demers. 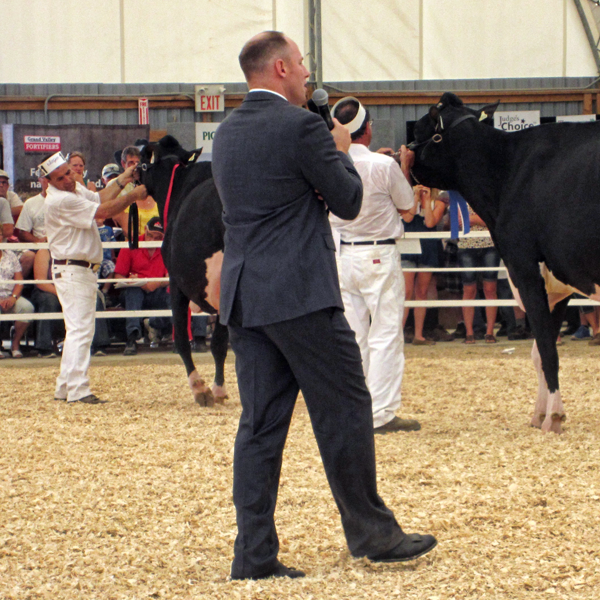 However, having watched the classes first hand and knowing Judge Crack as I do, I would say it was more that the exhibitors knew exactly the type of cow Judge Crack likes and knew that it would be worth their while to make the long trip to The Ontario Summer Show. If you look at the winner of every cow class, they all type in together extremely well. You had to have a great udder, dairyness throughout and you had better have an animal with great mobility. That was supported by an exhibitor of a 2nd place animal who reported that as soon as his cow stuttered (blamed on a rock in the ring) he knew that he would not be winning that class. Watching the Sr 3 Yr Old class unfold reminded me of 1999 when I had the chance to work with the western Canadian string when ACME STAR LILY was going head to head with RAINYRIDGE TONY BEAUTY. With both cows being from the same show string tension and speculation was high to see how Judge Comtois would place these two cows. Compared to Rejoice and Secret their difference in backgrounds was not as great. At that point Lily was the two time reigning Royal Grand Champion and Beauty was six years off her Royal win and had won Madison that year. However, in a similar way to Judge Crack’s handling at The Ontario Summer Show, Judge Comtois stayed true to the same style he had selected all day and went with Lily. Of course, there was a wide-ranging response from the ringside. The biggest thing I love about these cases is that both Judge Crack and Judge Comtois stayed true to what they liked and did not give in to the ringside pressure. While everyone is entitled to their opinion, the opinion that matters most is that of the judge. For all those who would have placed them differently, “Fantastic!” I am sure you could have given a great set of reasons too. The thing you need to remember about judging is to stay true to what you like. The judge’s job is to set a pattern for the breed. Do that and you will earn the respect of everyone that matters! It takes guts to pick the glory! 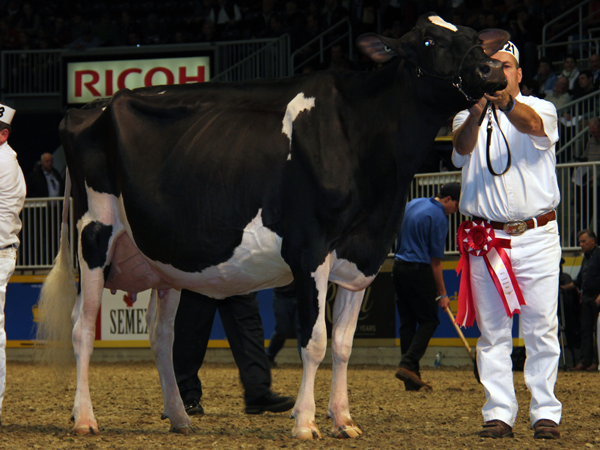 There is no question that, for many dairy breeders, there is nothing more exciting than winning at the Royal or Madison. Along with the fame comes the fortune. But what happens for the other 99% of people who don’t win? Do they make any money? Does their need for inner self-gratification get satisfied? 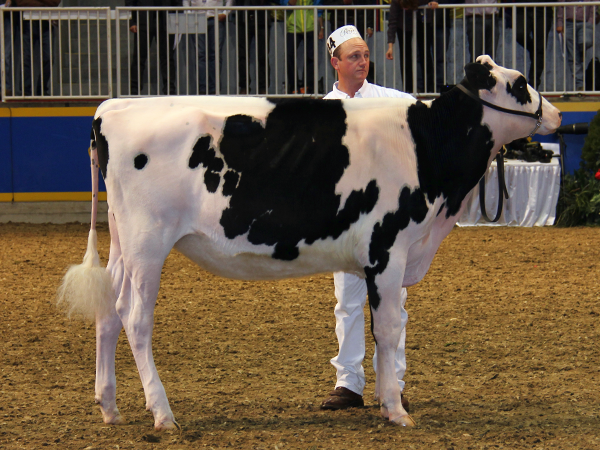 There are many reasons that breeders show their cattle at the local fair, such as supporting their local community, or helping teach their children the joys of the dairy cattle community. However, when it comes to competing at the championship, state and national level, is there really justification for the time, effort and expense? A breeder either “gets lucky” or “by design” breeds a great one, and, if they are fortunate enough to know what they have, they sell it for a significant profit to one of the many cattle dealers that run the roads. When it comes to buying the top animals, it really comes down to a small group of buyers. These buyers seem to trade cattle like they are playing cards, and it’s hard to tell if money is actually being made, or is it the same money going around in circles. Should Dairy Cattle be more like Race Horses? The dairy cattle industry is not like the horse racing industry that has gambling revenue to support their cause. I can still remember in Ontario when they wanted to add slot machines to the horse racing tracks and the breeders fought it tooth and nail. 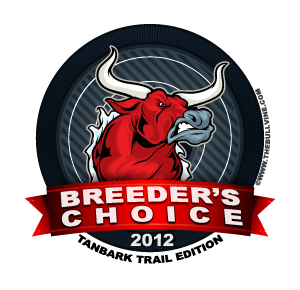 In the end it more than quadrupled there prize money and made many breeders very very rich. Is there any way we could add betting on show results? (Oh wait that is a can of worms we may not want to touch. Watch for it in a future Bullvine article). In reality, the only ones that really make money at this are the small few that have a class winner at Madison or the Royal, or those that are fortunate enough to get lucky with a homebred animal that can compete at the National level. All the rest are spending a great deal of money to support their ego. I equate it to the same amount of money that big time sports players make. Yes, you see these million dollar contracts for the big name athletes. However, for every one of those there are twenty that you never heard of that spent a great deal of time and energy chasing a dream. The scary part is that, much like in real life, the big name athletes seem to make more money than say a doctor. They’re good at a game. Doctor’s save lives. The same is true at the top sales. You see the major show cattle selling for millions of dollars and yet the top LPI or TPI cattle don’t sell for as much. 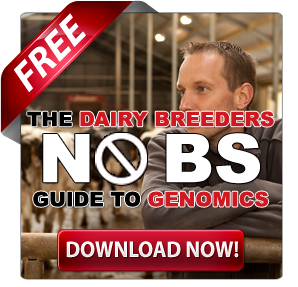 Don’t the top TPI or LPI cows drive the most profit for dairy breeders? Shouldn’t they command the highest prices? 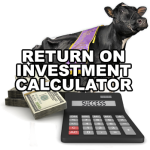 When investing in show cattle the big question you need to answer is why you are doing it. 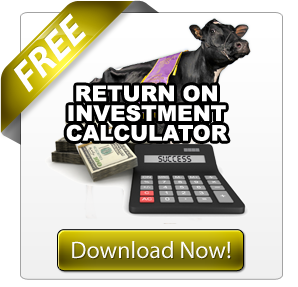 Are you investing to make a huge profit? If so I wish you luck. However, if you are investing because you love preparing great cattle to parade in top showcase events or love the thrill of competing against the best in the business then more power to you. The big thing is know your own reasons and stay within what works for your operation. Profit. Ego. Passion. Where do you pull into the line?